Why the break? Well, after doing this for about a year it became apparent that October 2011 needed more prep work than I could handle-- I had a trip to two of the major US toy companies, a convention in New York, and I'm moving into a new office all within a 3-week period. 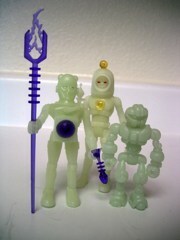 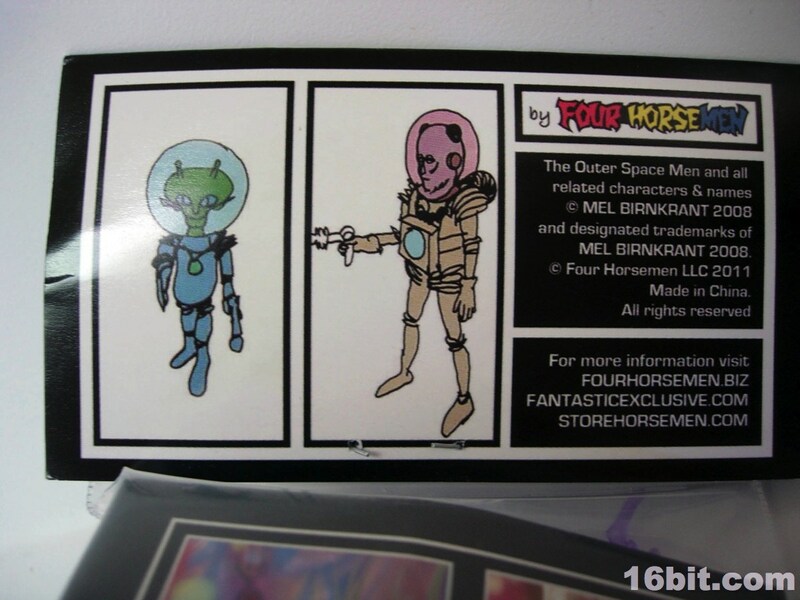 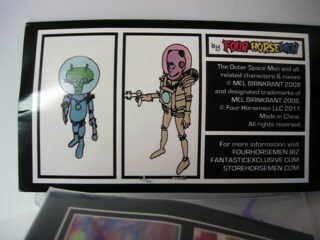 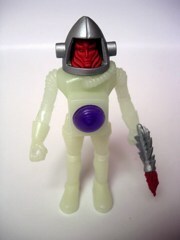 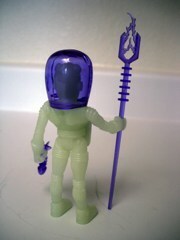 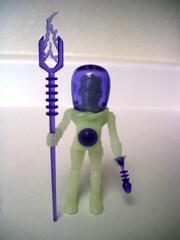 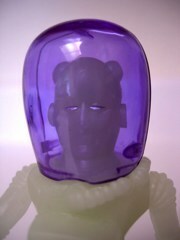 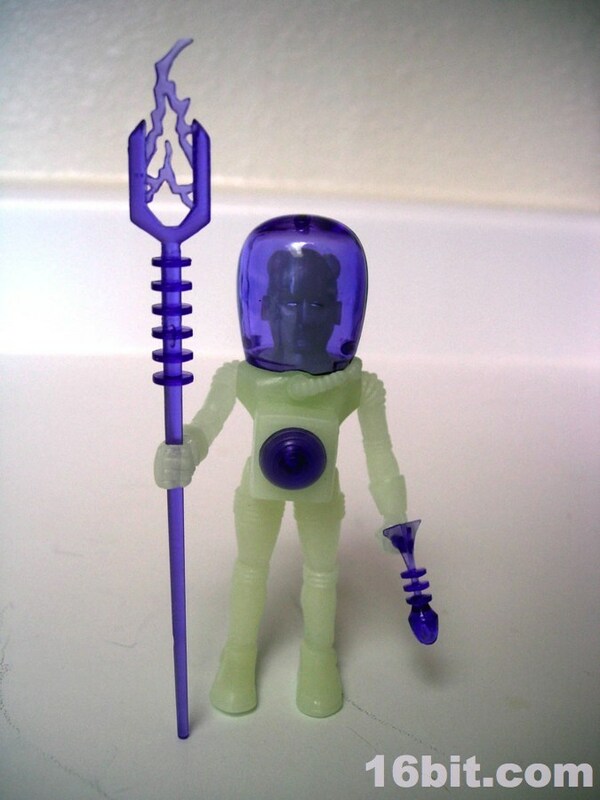 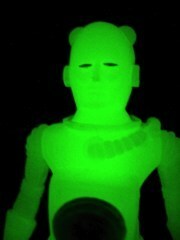 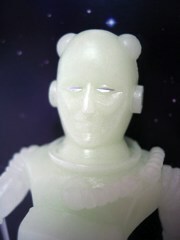 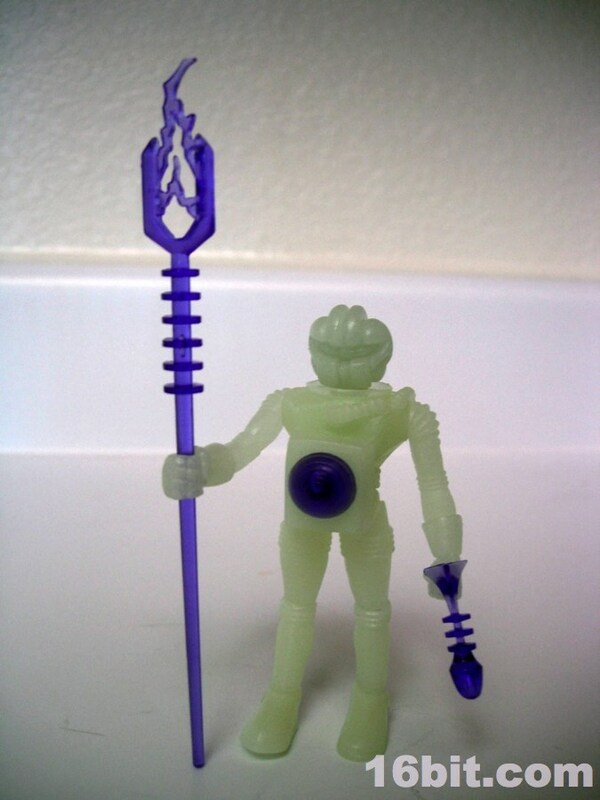 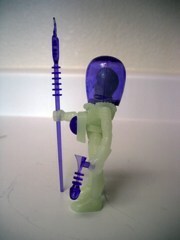 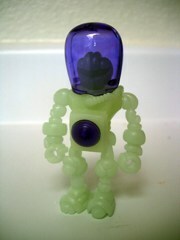 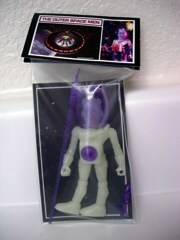 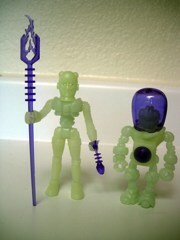 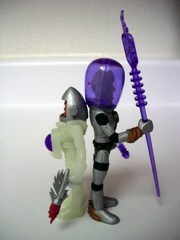 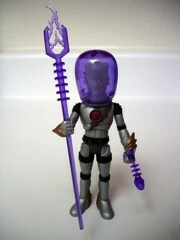 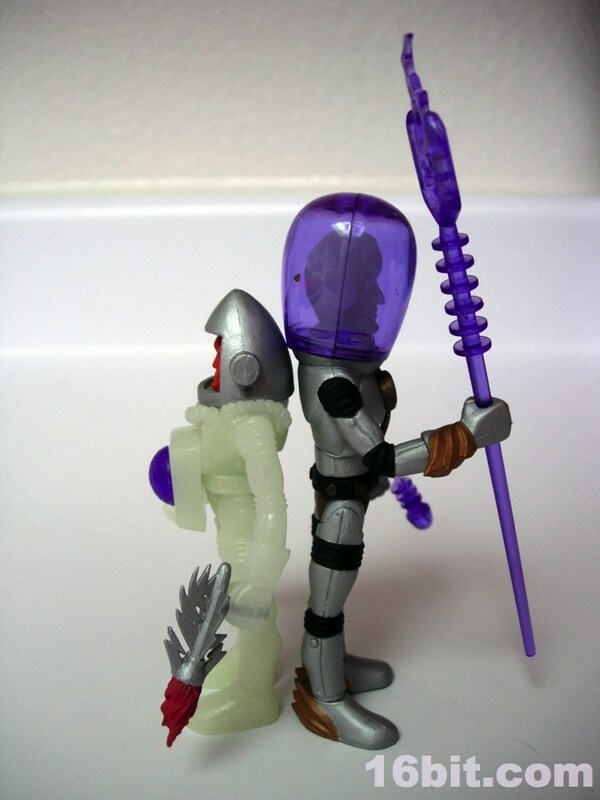 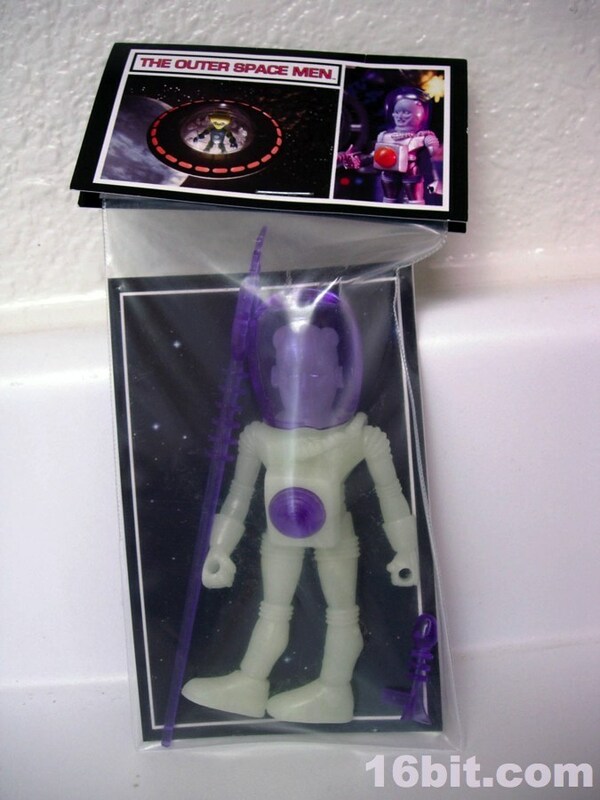 So let's continue with Electron+, the second glow-in-the-dark release in the Outer Space Men line after Metamorpho in 2010. 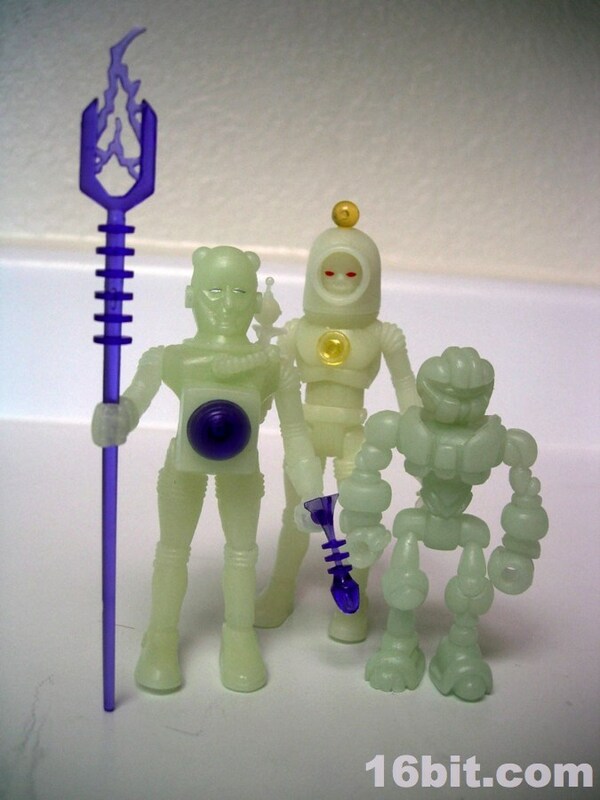 As the first action figure of Electron+, it's worth noting that while the arms, legs, and lower torso were recycled, the figure is actually shorter than other figures in the line. 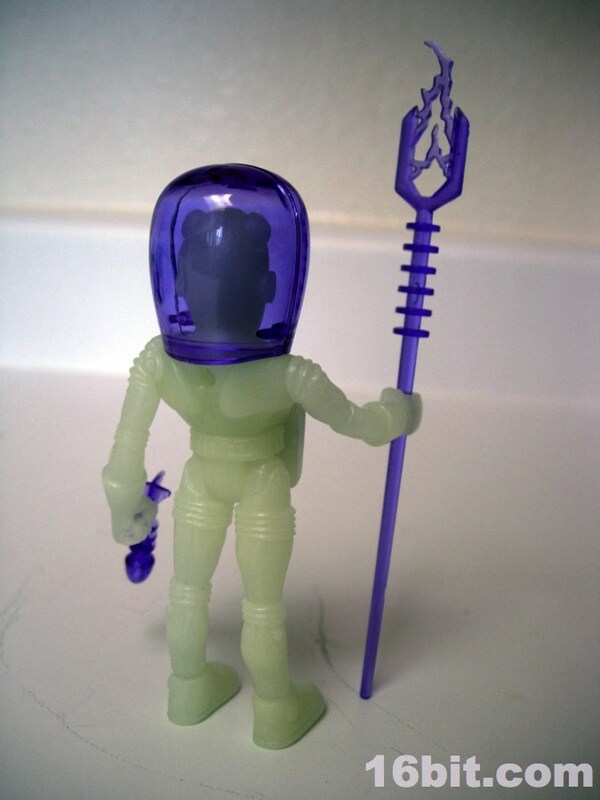 The short-but-not glow-in-the-dark figure is actually about 3 3/4-inches tall, and about 1 1/4-inches of that is ABS plastic purple helmet. 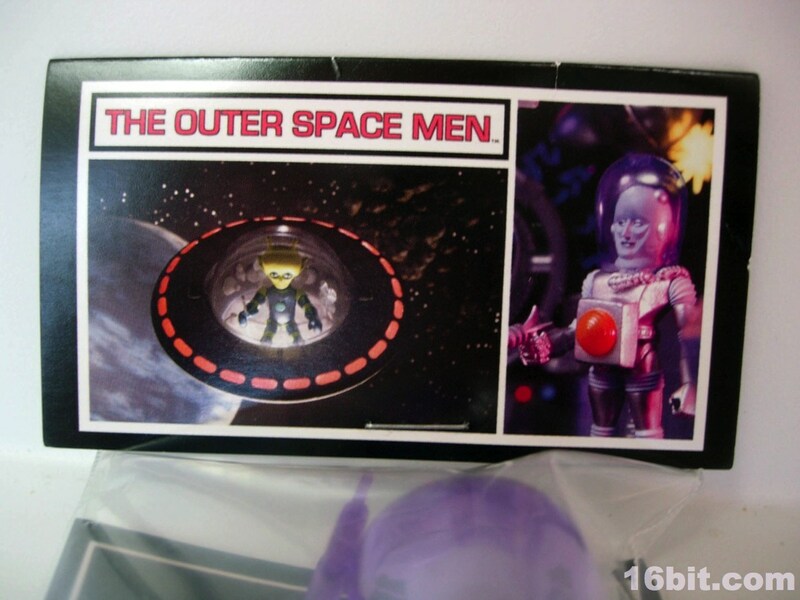 The design makes clever reuse of existing parts, but the sculpt-- while excellent-- is hampered in its toy-ness by the giant chest panel which hangs over the crotch. 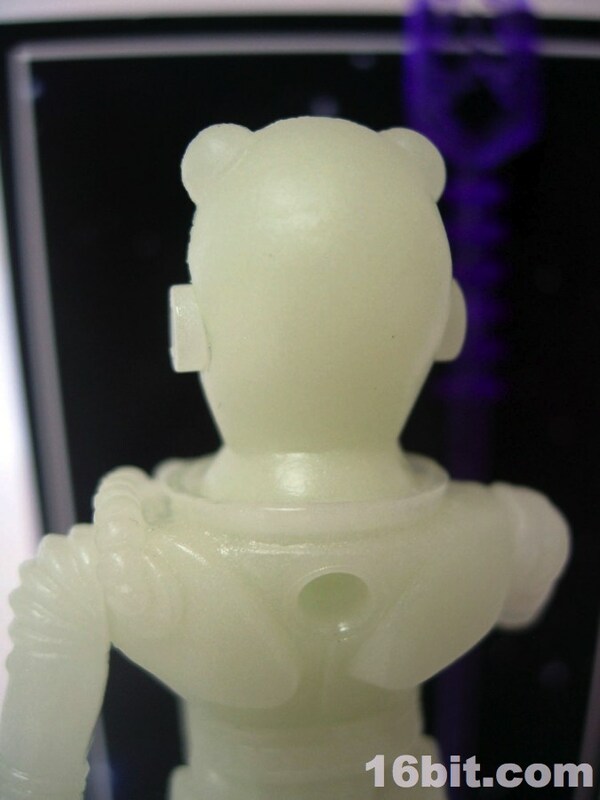 In short, it repeats one of the most frequent sins of Star Wars figures, being unable to sit or bend his legs much past 30 degrees. 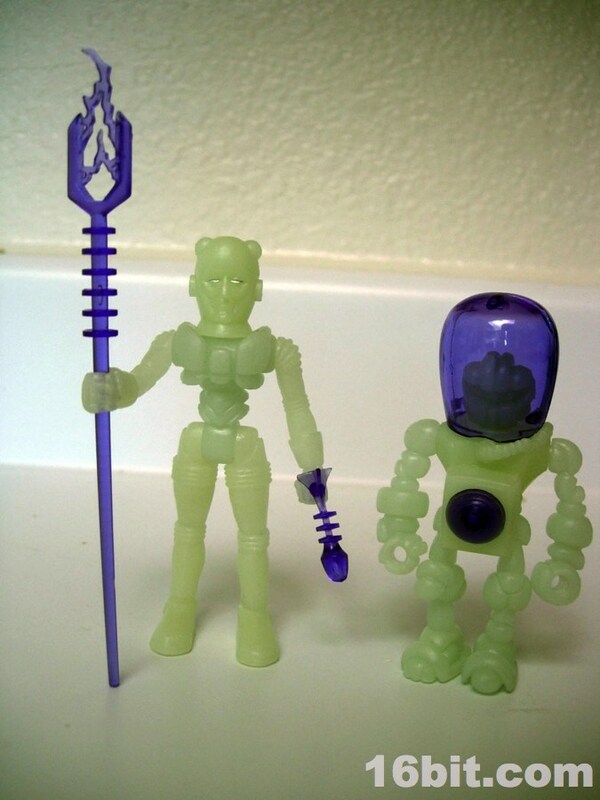 While collectors of the line probably aren't very concerned about being able to sit, it was one of the things that really impressed me with its 2010 debut-- not only did they look good, but you could really play with them. 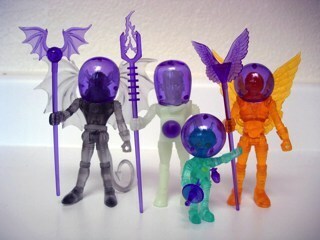 As much as I love wings, giant tails, and huge colorful purple buttons, Electron+ is simply not as much fun as the previous figures. 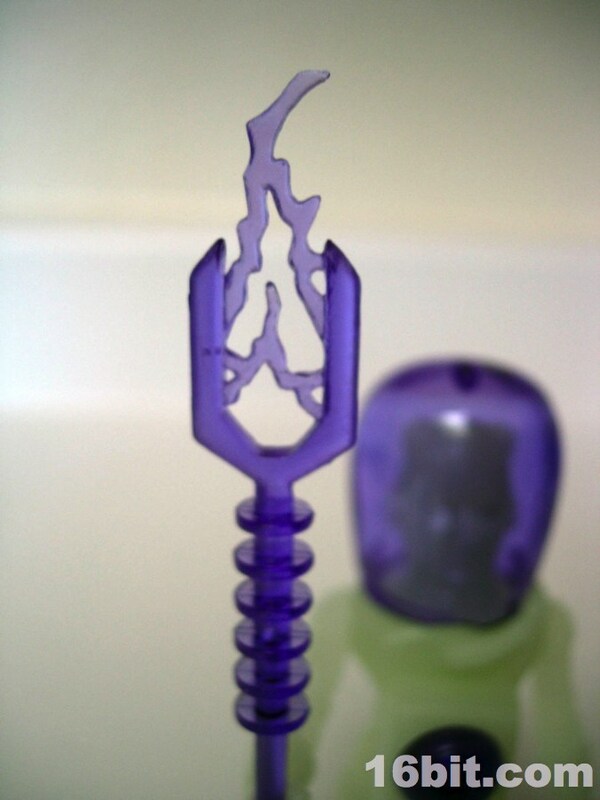 It looks cool though. 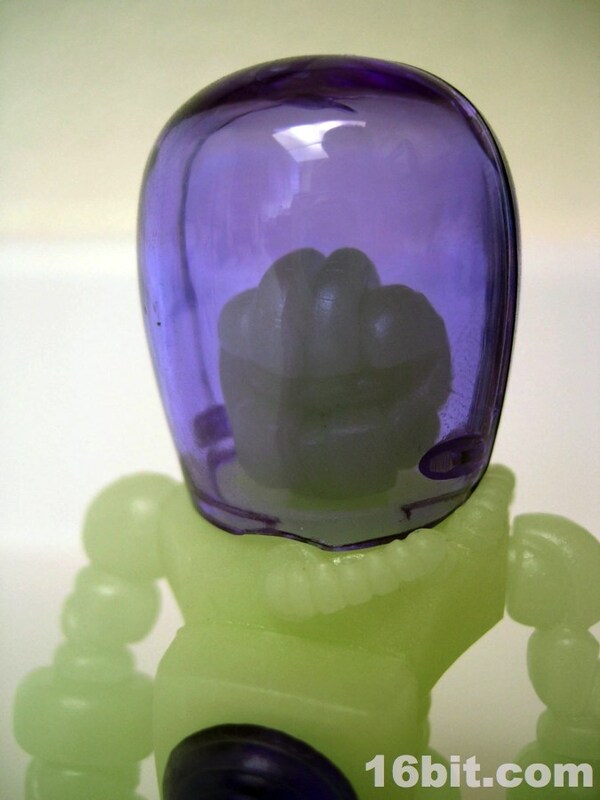 The Man from Pluto uses the same Glyos construction as other figures, with no new smaller pegs or anything weird to complicate things. 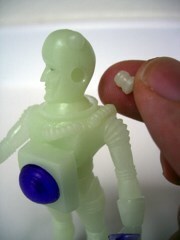 (See below for part swapping shots.) 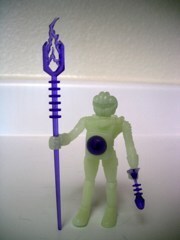 When you get right down to it, only the purple elements, the head, and the upper torso are new. 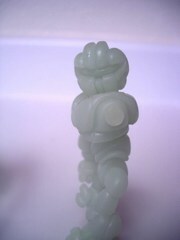 There's not a ton of sculpted detail on the new bits, but it doesn't mean that the sculptors cheaped out-- far from it. 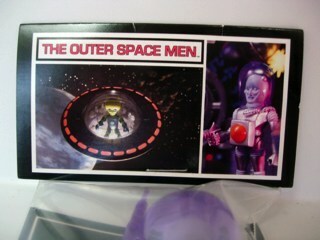 Of course, this isn't to say they didn't put in some surprises here. 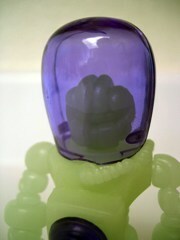 The head has these "plugs" on it, and the two big ones where his ears would be are actually completely removable Glyos plugs. 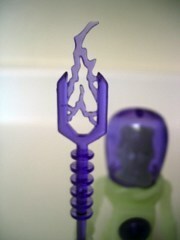 Presumably, this is so you could add a "lightning bolt" or other accessory down the road, should you or a customizer make one. 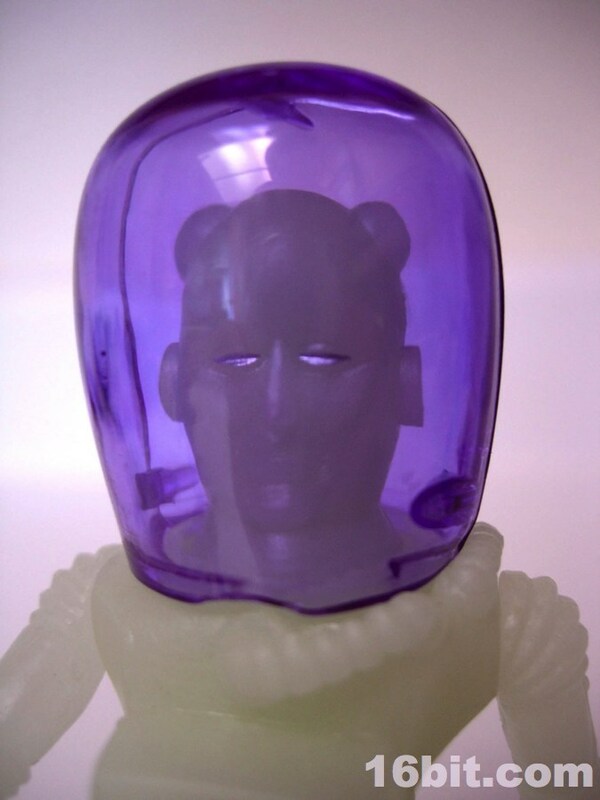 You could also stick a hand, a head, or some other alternate piece in here if you were so inclined... and it's plenty weird. 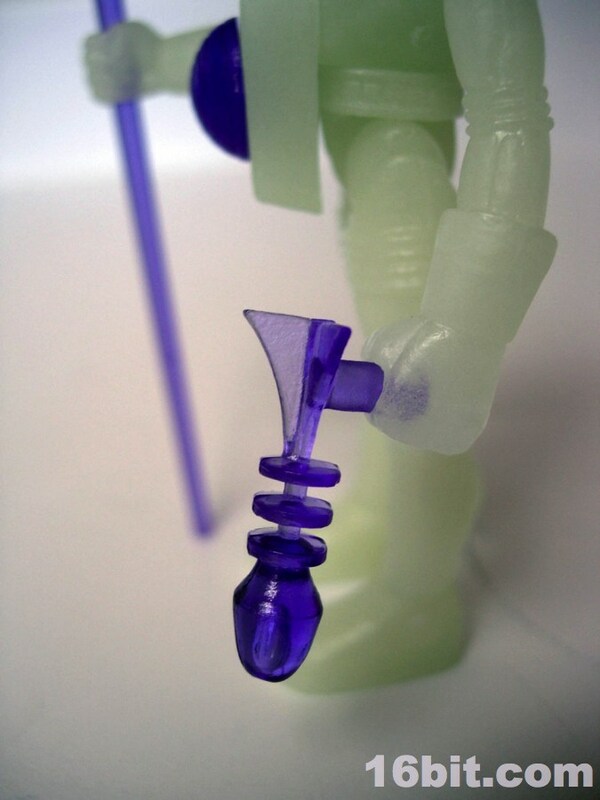 The plug could also go on a shoulder, so if you wanted to make a one-armed man, assuming you were doing it with a glow-in-the-dark Glyos figure, it's possible.